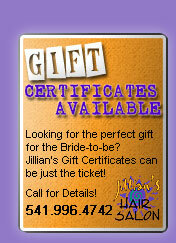 Let the professionals at Jillian’s Hair Salon help you look your best! A hair and makeup consultation can help you relax and enjoy the last minute details of preparation on your wedding day-confident that this major detail is perfect. Prices listed are approximate until a consultation has been done and determined according to the length and thickness of hair and style requested. We are a boutique salon therefore we ask appointments be reserved at least two – three months in advance. We would appreciate at least seven days advance notice to cancel any salon service. Blue Water Photography offers professional wedding photography services for your big day — click here to learn more. Please bring your veil or other hair decorations you may wish to try during your consultation. Includes placement of accessory (i.e. veil, tiara or flowers). Please let us know if you are adding hair accessories. We recommend a Bridal Make-up Consultation 1-2 months prior to the wedding day.